The black-striped mussel is a small marine bivalve mollusc found in a group called the false mussels. Black striped mussels can live up to two years and grow to about 2.5 cm long in around six months, but need only be half this size to begin breeding. Each mussel releases tens of thousands of eggs and can spawn every four weeks. The black striped mussel is typically found below the water level in subtidal environments, it can also survive in the intertidal range. 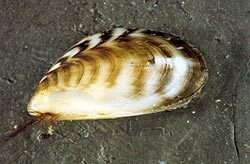 They are native to the tropical and subtropical waters of the eastern Pacific, the Gulf of Mexico and northern parts of South America, Like its close relative, the zebra mussel, the black-striped mussel is a significant pest in many countries outside its original range. Where are they found in Australia? As well as being found in Australia, black striped mussels have now spread to Fiji, India, Japan, Taiwan and Hong Kong. 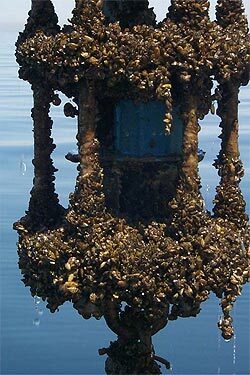 Black striped mussels invaded Darwin Harbour in 1998-99. Fortunately, the incursion was limited to an enclosed marina but eradication required pumping copper sulfate and chlorine into the infested site. Transportation of black-striped mussels around the world has been linked with vessel hull fouling, and larvae could also be carried in ballast water. They foul anchors, pylons, buoys, stormwater pipes, vessel hulls and breakwaters and compete with native marine species for food and space, leading to a substantial reduction in biodiversity.They are perhaps the most serious threat to tropical Australian waters. Wherever Mytilopsis sallei has invaded, it eventually manages to dominated the marine habitat. In its preferred inshore, low estuarine habitats, introduced populations of black striped mussel are capable of forming mats 10 to 15 cm thick. To remove them from Darwin Harbour, the marina gates were closed and the water, vessels and all other submerged surfaces contained within the marina were exposed to copper sulfate and chlorine which were poured into the water, killing the mussels. This was possible due to the limited area they were found in. AQIS has strict regulations regarding the berthing of vessels in Australian waters and, with few exceptions, requires vessels to conduct a mid-ocean exchange of ballast water en route to Australia to minimise the risk of introducing pests such as black striped mussels. 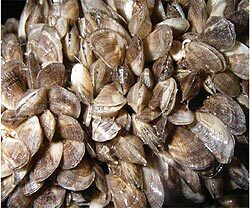 Fouling cause by Zebra mussels, close relatives to black-striped mussels.